The Bree Cheese got a superb performance from third baseman Eladio the Fell. Still, it wasn't enough to beat Ravenhill. The Darkwings won the game, 5-4. In spite of the loss, the Fell was named the player of the game. He went 2 for 3 with a home run. He drove in 3 runs and scored once. Zoello R�dinger earned the win to go to 4-0. He allowed 4 earned runs on 11 hits, with 1 walk and 10 strikeouts. Atanarat An�r� notched his 29th save in 32 chances. 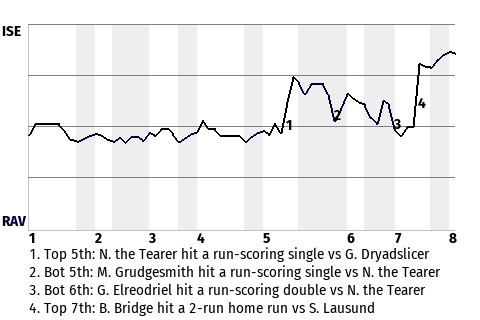 Had Sarkthor Gandillas not delivered a key base hit in the bottom of the eighth, the outcome might have been different. Instead, with two down and runners on 1st and 2nd, Gandillas hit a run-scoring single. That made the score 5-4, in favor of the Darkwings. "I was a little disappointed," said Bree manager Tonak Gnomedragger. "We could've and should've scored more runs." Ravenhill has now won 4 straight, while the Cheese have lost 3 in a row.